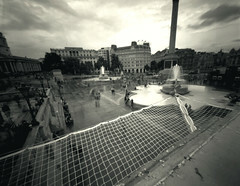 fourth plinth pinhole, by plinth pinhole. Adam Stone, a painter and lecturer based in Leeds, had a spot on the fourth plinth in Trafalgar Square, as part of Antony Gormley’s One and Other project. While perched on the plinth, he made a series of pinhole photographs. This entry was posted on Saturday, July 18th, 2009 at 12:33 pm	and is filed under photographers and other artists. You can follow any responses to this entry through the RSS 2.0 feed. Both comments and pings are currently closed.